There are few warehouses in Miami served by rail. Our team specializes in identifying these properties and when they will be coming available on-the-market for sale or lease. There are two railroads that service Miami: CSX Rail and FEC Rail. Often times we come across older industrial properties that have had the rail spur disconnected. This is unfortunate, however sometimes it is worth the investment to have the rail spur reactivated. The industrial neighborhoods and sub-markets that have warehouses serviced by rail in Miami included Miami Gardens, Gratigny, Hialeah, Medley, Airport West Dade and Homestead. Miami native and veteran industrial real estate broker, Ed Redlich, shares his perspective on Miami warehouses with rail. “There is a low supply of available warehouses in Miami with rail. Most folks using them now tend to do so long term. However, we have made it our business to determine when these properties may become available.” This is helpful to our customers who are seeking rail-served warehouses. Redlich continues “Growing up in the Redland, I crossed the train tracks in neighboring Princeton everyday to get to school. The area was known as “packing house row” since all of the produce that farmers harvested were distributed from a number of warehouses along Highway US1 and the rail.” Unfortunately, the rail was removed long ago to make way for the Miami-Dade County busway system. However, the CSX rail still remains and runs through the Redland and Homestead area. “There are several industrial properties in Homestead and the Redland that CSX could still service if needed”. Redlich adds that “Another neat feature about rail in Miami is that FEC Rail has a line on-site of PortMiami. This rail can receive freight from the port then rail it to your Miami warehouse or up the state and into the southeastern United States and beyond”. The FEC rail bridge at PortMiami was damaged during a hurricane in 2005. Since then it has been repaired and is integral to our transportation infrastructure. Below is some more general information on rail warehouses in Miami. However, we encourage you to contact us anytime to discuss in further detail. We always enjoy chatting about Miami warehouses and the rails. If you like, we can prepare a preliminary site selection of available warehouses with rail for your review. Shipping by freight offers a multitude of advantages for business and industries all over the world. Rail transportation is a safe and cost efficient way to transport all types of cargo. Here in South Florida specifically, rail-served facilities offer a centralized location for global trade along with easy access to the rest of the United States. In addition to railways, our area also offers convenient access to some of the nation’s largest seaports and airports. It truly is a shipping mecca! Some warehouses are traditionally rail-served with direct access to a main line, allowing products to be loaded/unloaded on site. Other warehouses offer an alternative form of access via rail intermodal terminals. This form of shipping incorporates multiple modes of transportation to move products (both domestically and internationally) through a mixed use of trains, trucks and ships. Here in Florida there are two companies that play a crucial role in the transportation of products by rail: CSX and Florida East Coast Railway (FECR). CSX is a leading transportation supplier that serves some of the largest population centers in the nation. As a Class 1 railroad, the CSX network encompasses about 21,000 route miles of track in 23 states and into parts of Canada. CSX provides traditional rail service as well as the transport of intermodal containers and trailers. Florida East Coast Railway (FECR) is a 351-mile freight rail system that runs from Jacksonville to Miami. Its mainline corridor offers major interstate and turnpike access, allowing FECR to move an array of products across the state. 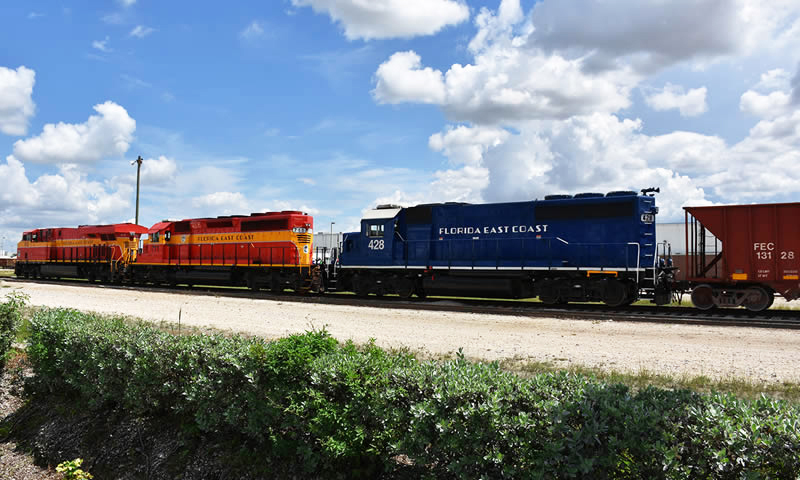 FECR is also the exclusive rail provider to South Florida’s ports with connections to CSX and Norfolk Southern in Jacksonville.